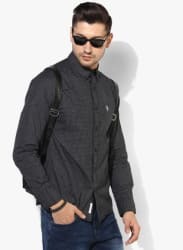 You will be the talk of the town, when you dress up in this black coloured casual shirt from U.S. Polo Assn.. This casual shirt features a great coloured combination. This casual shirt can be paired with jeans and loafers for a classy look at the next social gathering.